Ms Scott’s full statement is here. 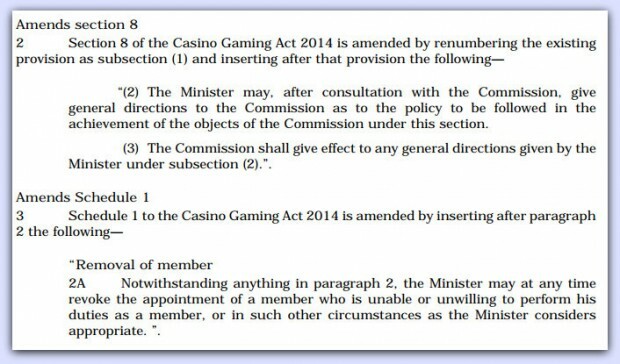 Minister of Economic Development and Tourism Jamahl Simmons said, “The Casino Gaming Amendment 2017 tabled on Friday brings Bermuda in alignment with other jurisdictions in terms of allowing the government to provide policy direction and allow the Minister to remove members of the Commission who do not follow legal directions of the Government. This mirrors Singapore Gaming Legislation as seen in that jurisdictions Casino Control Act [Chapter 33A] Clause 11, Schedule 1. Since the Bill was tabled on Friday, we have asked both the Commission and the Commission Chairman for a response, and will update if able.